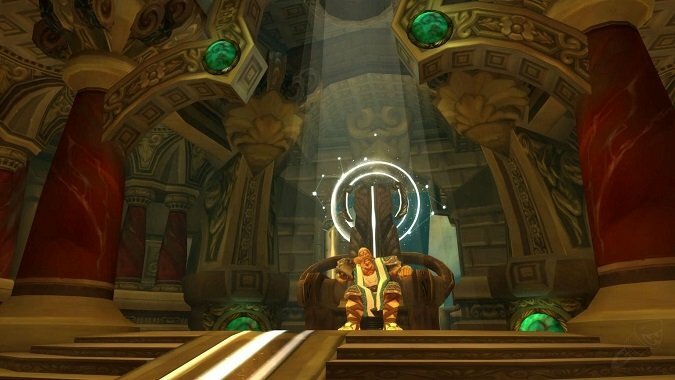 Way back in Wrath of the Lich King, we discovered some lore that blew the lid off of everything we knew about Azeroth’s history to date. 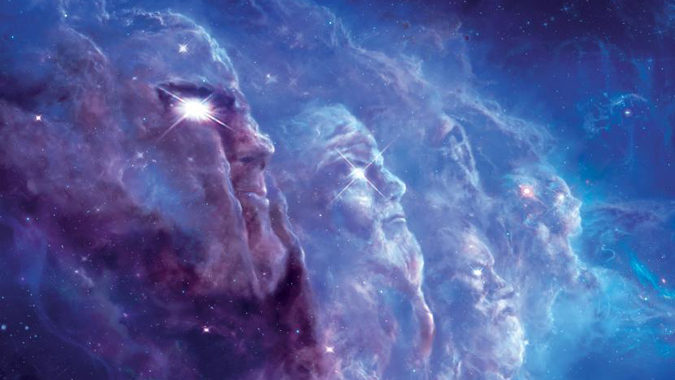 The Tribunal of Ages explained, in detail, exactly how the world was created – or so we thought. Because in Chronicle, we’ve since learned that all that information we were given was in fact a lie, constructed by Loken to cover his crimes. Loken was never the Prime Designate of the Keepers – that was Odyn’s job. But beyond that, there was the matter of the Curse of Flesh. We were told this was something the Old Gods used to render the creations of the Titans defenseless. Since then, we’ve seen evidence of the Curse of Flesh everywhere. Humanity is a result of it. But it’s not irreversible – which makes one wonder…if the Tribunal of Ages is a lie, is it possible there’s no “curse” of flesh at all? To answer this question, we need to look at one piece of history we know is true – the Discs of Norgannon. These Discs recorded all history in the world, and were essentially the “correct” version of the Tribunal of Ages that Loken manufactured. 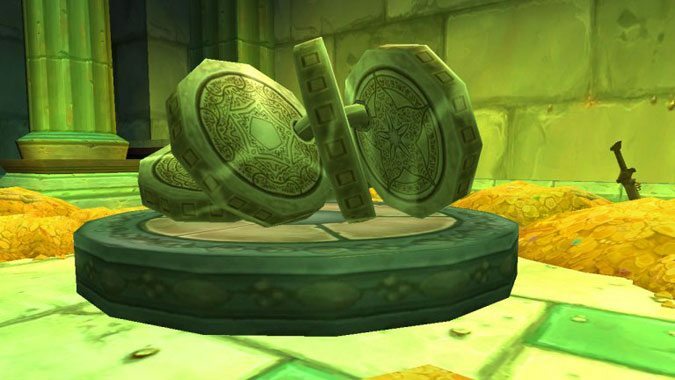 Stolen by Tyr, Archaedas, and Ironaya, the Discs were eventually taken to Uldaman and locked away in a vault. There, they remained undiscovered – until intrepid adventurers managed to defeat Uldaman’s defenses and find them, of course. But the odd part is that the Discs also refer to the Curse of Flesh…in a way. They reference a matrix destabilization that affected the Earthen, causing them to evolve into either Troggs, or Dwarves. In the Tribunal of Ages, the Curse of Flesh was also referred to as a matrix destabilization. But there’s one line in the Discs that makes this whole puzzle even stranger to look at. The Creators are the Titans. The Titans were fully aware that there was the potential for a matrix destabilization. In other words, they knew about this supposed “Curse,” and not only didn’t care about it, they viewed it as acceptable. It wasn’t a bad thing – it was a natural thing. And this makes absolute sense because we’ve got another example of it happening, on another planet entirely. Draenor wasn’t a seed world – there was no world-soul residing within it. But that didn’t stop Aggramar from making some changes in an attempt to help the planet flourish. He created Grond by infusing the largest of Draenor’s mountains with the raw, overwhelming energy of an elemental storm. Grond was a creature of stone, crafted with the intent of culling the Sporemounds and the Evergrowth. He was defeated by Botaan – but his remains spawned new descendants, the colossals. 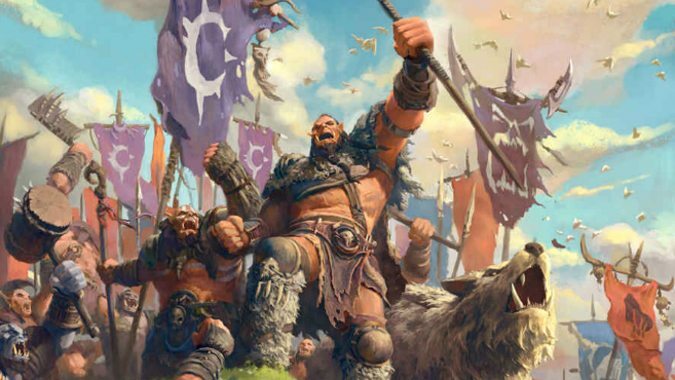 From the colossals came the Magnaron, then the Gronn, then the Ogron, Ogres, and Orcs. Each progressive evolutionary link was smaller. And eventually in that chain, creatures of flesh were born from stone. Titan creations, once again experiencing a matrix destabilization of sorts over time. Except this time, there were no Old Gods involved. There was no interference from the Void, there was just…Draenor, on its own. And from this, the only logical conclusion we can draw is that the so-called “Curse of Flesh” is simply something that Titan creations do. It’s part of their design. The Discs of Norgannon spoke of how the Creators “seeded and shaped the world” – maybe these Titan creations were simply the seeds. They shaped the world, then evolved to inhabit it. Even in this revised version of history, meant to make Loken supposedly look blameless, he didn’t. The conclusion Brann Bronzebeard drew from this particular piece of history was that Loken sounded like a nasty character. This seems…odd, given that Loken created the Tribunal of Ages so that in the event Algalon showed, he would appear to be the innocent one. And then on top of that, he switched Algalon’s signal so that the constellar would only be summoned upon his own demise. If that’s the case…why bother changing the texts at all? Why not just change the signal and be done with it? There are levels of deception there that we still have yet to untangle. It’s not just that Loken was giving us an incorrect version of history – it’s that the Old Gods were giving us an incorrect version of it. If the Titans arrived, one would think they’d immediately know that the history presented was manufactured. It may be the case that the Old Gods weren’t expecting the Titans to find this history – they were expecting us to find it. But we need to go back to Grond, because the creature establishes a pretty important point – Titan creations appear to be made by design to eventually devolve. In theory, one would assume that this means over time, the Keepers and other Titan works were meant to become obsolete. The question then becomes a matter of whether or not the Titan creations were actually aware of this process. If they were, this explains a lot. Odyn was absolutely incensed at the very idea of having the Dragon Aspects take over the world’s protection. As far as he was concerned, that was his job. They were, in a sense, making both himself and his titanforged obsolete before their time. What if whatever seed the Old Gods planted in the Forge of Wills wasn’t, in fact, a Curse of Flesh? What if it was simply a method of expediting the process – meaning that the creations of the Titans would simply go through that devolution process far more quickly than intended or designed? Maybe the “curse” wasn’t really intended for us at all. We’re not the target. We were never the target. There’s nothing wrong with us, there’s nothing inherently flawed about our design, we just evolved faster than necessary, in order to rid the planet of the Titan’s defenders, and leave it helpless. There are few statements we drew from the Tribunal of Ages that are absolutes. One was the idea of the Curse of Flesh. 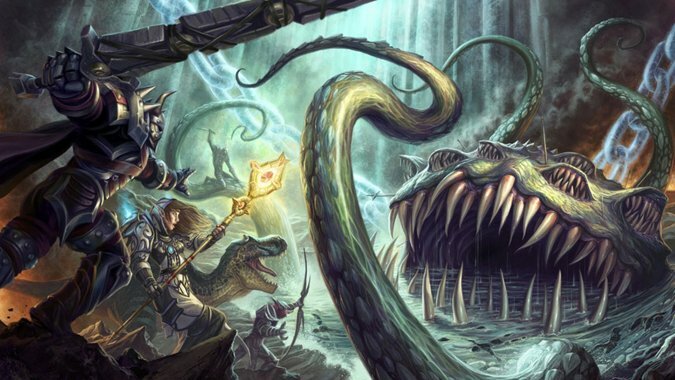 The other was the irrefutable fact that if we killed the Old Gods, Azeroth would be destroyed. We know, through Chronicle, that this is at least partially true. 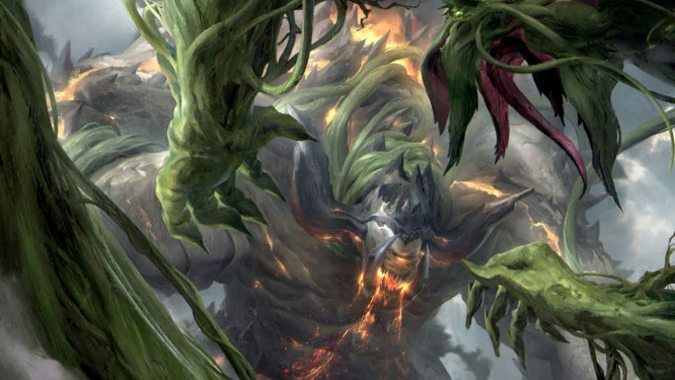 Aman’Thul tried to rip Y’shaarj from the world, rending a wound in the planet that would later become the Well of Eternity. If you start ripping those Old Gods out of the planet, you’re just going to tear Azeroth to shreds. But we aren’t going to rip the Old Gods from the planet. We’re far too small, and we don’t have the capability of doing so. We can, however, hunt down an Old God in its lair and put an end to it, or try to. We wouldn’t be tearing the world apart when we did so – would there be a corpse left behind? Yes. Would we have to deal with the fallout? Yes. But we already proved we’re capable of doing so on Pandaria. Is it so difficult to think we’d be able to do it again, if needed? It’s beginning to look like we may be about to find out. Regardless of the truth behind the demise of the Old Gods or the validity of the Curse of Flesh, it feels like between everything we witnessed in the Emerald Nightmare, the whispers of Xal’atath, and other hints in Legion, we’re headed towards a reckoning. N’Zoth may have been the weakest of the Old Gods according to Xal’atath, but he’s had thousands of years to grow stronger. We’ll have to wait and see if we’ll be defeating the weakest of the bunch – or the only one with enough strength and clever skills to outwit and outlast them all.